Average time on page is one of the biggest web analytics lies that a lot of us consultants accept, without doing anything about it. First, read how Google Analytics calculates session durations. Its very straight forward. And then, get started with setting up Timer Triggers to measure your website visitors more accurate. The user spent 10 minutes on the website. First interaction at 10:00, followed by another interaction at 10:05 (the user have now spent 5 minutes on the website) and then navigates to the third page at 10:10 (the user have now spent 10 minutes on the website). Google Analytics does not understand when the user close the browser tab. If the user spends 15 extra minutes on page 3 and then close it – no further interaction have been made. No data to collect. No hit sent. But we can change all this with the help of the awesome Trigger Timers in Google Tag Manager. 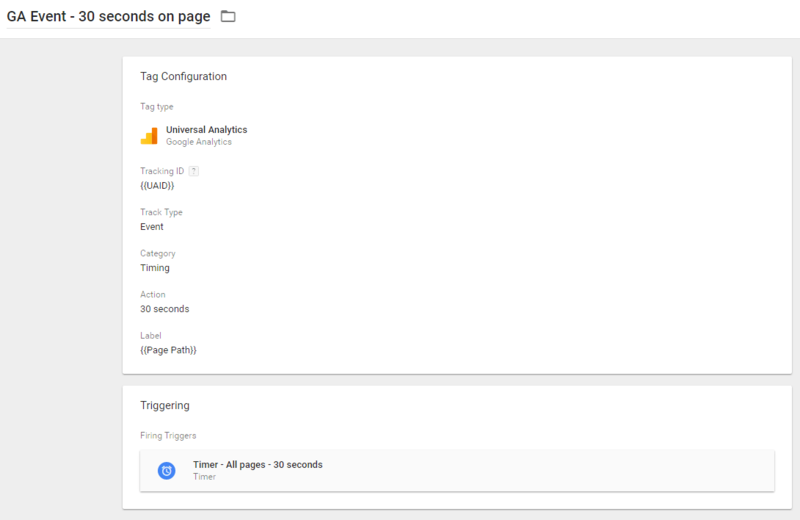 To create your Timer Trigger, head on over to your Google Tag Manager account and hit up your list of Triggers. Create a new Trigger and choose Timer as the Trigger Type. The interval is set in milliseconds (30 seconds is 30 000), limit the Trigger to fire once and the set the conditions for the Trigger to activate. For a small website, like this blog, you can choose all pages. But for big websites, make sure you don’t set up these Triggers for all pages. You might get overrun with Hits. After we’ve set up our Timer Trigger, we’re going to create a Tag that push an Event to our Google Analytics Property. 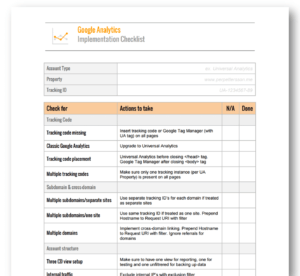 Decide on how you want to sort the Event Category, Action and Label in a way that follows the rest of your Event Tracking logic for easy managing them all in your Google Analytics account. Choose our newly created Timer Trigger, save, preview and (if it works) publish. You can create a variety of Timer Triggers and Tags this way. 30 seconds, 60 seconds, 90 seconds – you get the picture. Easy way to measure time with gtm, I had no idea.Thanks! Can you do something like: more than 2 minutes on the page? Of course! You can set the timer to whatever you like.